ENGLAND’S DISSATISFACTION with Puritan Lord Protector Oliver Cromwell, 1599–1658, led to more than the people’s exhuming his body in 1661, hanging it in chains, beheading it, and then losing the head. The 1660 restoration of British royalty also restored public theater. According to Wikipedia, Restoration comedy was “refinement meets burlesque,” the latter in its original sense derived from the Italian burla, “a joke, ridicule, or mockery.” That is, burlesque was originally a caricature of society, not a bubble-dancing spectacle put on for seedy guys in raincoats. On the other hand, George Etherege’s play The Comical Revenge, or Love in a Tub, 1664, involved a fellow who lost his trousers. Engraving by Louis du Guernier. Puritanical rule came with the Rump (we’d say Lame Duck) Parliament and people with names like Praise-God Barebone. Not that Restoration Comedy didn’t have its Anne Bracegirdle and Susanna Mountfort. Note, these two were not role names, they were real actresses. 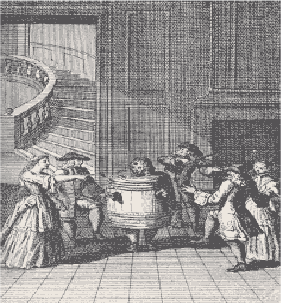 In fact, as described here at SimanaitisSays in “Restoration Comedy—A Pendulum Swing of Cromwell’s Protectorate, women had been kept off the stage until the Restoration. Hitherto, young men played women’s roles. Here are some tidbits on several women of the Restoration stage. Anne Bracegirdle came by her surname honestly, the child of Justinian and Martha (born Furniss) Bracegirdle. According to Wikipedia, she was probably fobbed off to theater people who raised her from an early age. 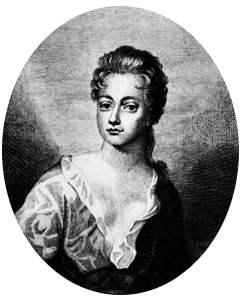 Anne Bracegirdle, 1673–1748, English actress. Anne was known as a comedienne in plays such as Aphra Behn’s The Widow Ranter, 1689, in which she had a “breeches role.” We’d call it a trouser role today, with a woman playing a man’s part. Susanna Mountfort, born Percival, came by her other names, Mountfort and Verbruggen, through marriage. She made her stage debut in 1681, specialized in breeches roles, and married actor William Mountfort five years later. In 1692, a scandal erupted through Anne Bracegirdle’s supposed interest in William Mountfort. Captain Richard Hill, an unwelcomed admirer of Bracegirdle, together with cohort Charles Mohun, 4th Baron Mohun, ambushed Mountfort and, during the struggle, Mountfort was stabbed in the chest. 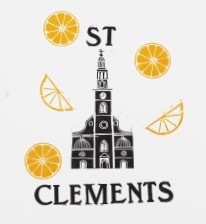 He died the next day, legend having it that a bell of St. Clement’s (“Oranges and lemons/Say the bells of…”) cracked while tolling his funeral. Image from The Lost City of London. Following the attack, Captain Hill fled to France. Lord Mohun was tried by his peers and acquitted 69–14. Mrs. Mountfort née Percival married actor John Verbruggen in 1694. He had the surname Verbuggin at the time. A Selection of Restoration Comedies. Titles give an idea of recurrent themes: She Would If She Could, 1668; The Wives Excuse, 1691; The Provoked Wife, 1697; The Perjured Husband, 1700; and The Busie Body, 1709. 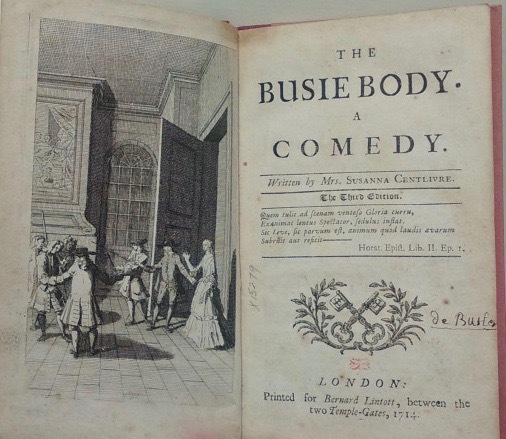 The Busie Body, 1709, a Project Gutenberg eBook. Image from Eighteenth Century Fiction Journal. This entry was posted on March 31, 2019 by simanaitissays in And Furthermore... and tagged "The Busie Body" Susannah Centlivre, "The Widow Ranter" Aphra Behn, George Etherege "Love in a Tub", Oliver Cromwell closes theaters; King Charles II reopens them, Susanna Percival/Mountfort/Verbruggen Restoration actress, William Mountfort Restoraton actor murdered.